There was a pretty good nip of Fall in the air for this past Sunday’s Lisa’s Legacy Run which in my book is perfect running weather. 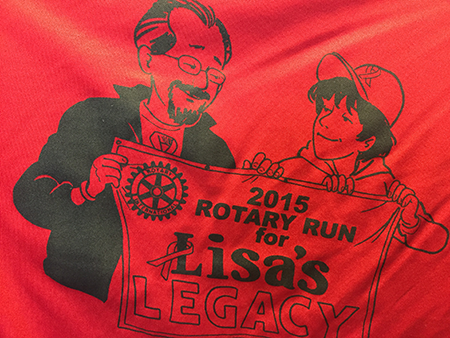 I just want to give one more shout-out to the Mentor Rotary for the terrific race they put on. Everything from registration, to route set-up, to the great red Tee, to the final awards ceremony was handled with efficiency and class. The race grew this year and we’re hoping to make it even bigger next year. On October 8th I’ll be at the Mentor Rotary luncheon to help present the check to the University Hospital’s Lisa’s Legacy Fund for Cancer Research. Before we close out this year’s event, I’d like to congratulate all of the medal winners including fellow cartoonist Terri Libenson of The Pajama Diaries who showed up and took an award as one of the top female runners, as well as everyone who came to run and support a good cause. Good fellows all and well met. See you next year.